Put in is at the Henry County (Va) access on Va Rt. 706 below the Martinsville Dam. This is an easy Class I run until you get to Eggleston Falls which is a Class II. There is a batteau sluice on river left if you do not want to run the rapids. 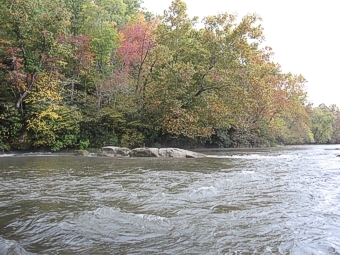 Take out is on Marrowbone Creek on river right just below the falls. Go up the creek a couple hundred feet to the steps. The new access at the Sports Complex is at the half way point. It is about 1/2 mile beyond the US58 bridges on river left.